I thought that after the revolution, I would not see such great things I used to see during the protests, as Christian human shields to Muslim prayers or Muslim human shields to Christian prayers. Not that I make distinctions between either. It’s not that Christians protected Muslims or Muslims protected Christians while praying! We don’t make those distinctions between a Muslim or a Christian. We just don’t have this culture! Or hear people shouting “Selmeya+, peaceful, or EAD WAHDA “We are one hand”. Or I thought I would never see a police officer asked to kill us, but gets killed while refusing to let the prisoners loose on us. And yes, the days when our youth used to stand with very fragile weapons to protect us when police let thugs loose on us are over, and ran away leaving the streets empty with no protection. Those beautiful young men of my street no longer stand all night, to protect my balcony without being told to do so. I might not see the scenes of these people who did not wait for the government to put the fire out at the Egyptian Museum, Cairo’s most valuable possession, but went there, got their fire extinguishers out of their cars, and started to put the fire of a museum down with them now. Or see scenes of thousands and thousands of Egyptians standing in front of the Egyptian Museums and temples in Luxor, Aswan, Cairo, everywhere, with their bodies and hands around them, waiting and waiting endlessly for the Army forces to come and secure our history, our most valuable belongings, risking their own lives in a country where security did not exist anymore for those days. Fearing the tourists could be hurt, they gathered around them. Like the Egyptian saying goes, which I used to question, but not anymore, “Shabab zay el ward”, which literally means, “Youth just like blossoming flowers”. Indeed. I no longer hear “A group of students, also protestors, arrest 9 of the thugs trying to steal the Egyptian Museum, and turn them in to the Army forces.” on the news. Or that Muslims, with fragile weapons, went to the churches of their streets, but not to attack them as any western source of media would love you to believe, they went to protect them, WITH THEIR BODIES AND LIVES! Or hear ” Some of the protestors and some of the patients, who stood with their chests opened, ready for attack, defending the Children’s Hospital of Cancer, Al qasr el ainy’s hospital, and every single hospital, bank, property in their country, with broomsticks. I am not seeing those scenes of some of the protestors and some of the police forces TOGETHER trying to help each other close the doors of prisons so that the NDP would not be able to let thugs loose on us anymore. But I have seen lots of other, if not greater, things. ”I personally have disregarded whatever kind of injustices I had experienced under you. I have met a guy who still has 9 rubber bullets in his body, and came to clean. I have met a group of strangers who helped me come home, all men, and I don’t even know their names. 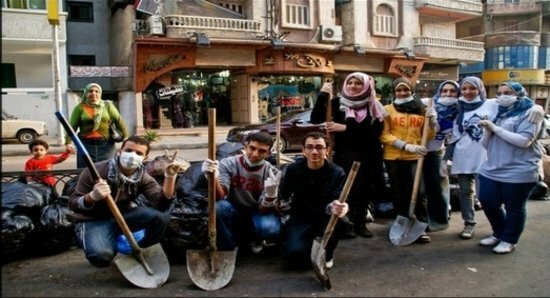 I have seen the disabled trying to clean every corner in Tahrir. I have seen strangers holding hands to prevent people from stepping on the wet pavement after painting it. I have seen very rich people holding dirt with their bare hands. I have seen strangers stopping other strangers and saying, “keep my phone with you, and if my wife calls, answer”. And I have seen their phones given back to them after 5 hours. I have seen old people who could not help, but chose to stay to encourage us. I have seen a lot of people, and I couldn’t know who are the Christians, the Muslim, the poor, the rich, the educated or those who haven’t had much schooling! I have seen people who no more say “It is none of my business. I am not going to save the world”. No, I have seen people saying, It is our country. They ran away and left it. We have to clean it. We have to take care of it”. I have seen them ACTING today, going to people and asking to stop doing that or start doing this, and people responded. I have seen people group up SO VERY SPONTANEOUSLY, not knowing each other, not knowing even each other’s names, to gather up to clean, or protect, or fix. AND I LEFT WITHOUT KNOWING THEIR NAMES, BUT WITH KNOWING THEIR IDEAS FOR EGYPT!! I have seen people clinging to their bad habits and negligence but once you talk to them, they stop, AND TELL OTHERS TO STOP! I have seen people hugging other people they don’t know. I have been talking with two girls, and five men, that I still do not know their names, but we have agreed on some things to do for Egypt, later on, together or alone. We have shared great ideas about what could possibly be done for Egypt, not just us, EVERYONE!!! walahy! Every single one. I swear! I have seen people cleaning a statue, embellishing and painting, the pavements. Collecting stones and sweeping the ground! I have seen people standing human shields to protect others. I have seen people giving money, food, drinks, and bags for us to throw rubbish in. I did not have to ask anyone for anything. AND OH MY GOD HOW POLITE AND CARING EVERYONE WAS ! I have seen INDEPENDENT Egyptians, proud Egyptians, smart and loving and caring Egyptians! REAL EGYPTIANS. I have seen strange men joining hands around me to protect me from the crowd, fearing I could be pushed, and without even asking them! People carrying sharp, heavy stuff without complaining, better, while chanting for Egypt. I have seen actors, directors, everyone today! I have seen mothers and very old ladies bending their very weary backs to collect dirt. We have reached Tahrir on time, but find no place to be cleaned, people cleaned everything before we even got there. We had no broomstick or cleaning materials, people gave us their own, which they bought with their own money, and said, “We are leaving, now it is your turn”. I have never seen people grouping so fast to actually TALK and discuss what could possibly be done to help Egypt. We have all talked, cleaned, protected, and helped and cared for each other. People distributing cleaning materials for free to anyone. People asking me to help them wear their face masks as their hands are dirty, people asking me to clean their glasses, help them drink, as they are dirty and busy. I have seen Egypt. Ladies and gentlemen, I HAVE BEEN TO THE FREE EGYPT! I have seen prisoners running away, but I’ve never seen any turning themselves in. I’ve seen a lot of people stealing, but I’ve never seen anyone giving things he has stolen back to its rightful people. I have witnessed sectarianism, but I have never seen a Muslim protecting a church, or a Christian Human Shield to Muslim prayers. I have seen people killing other people while the police are watching, but I’ve never seen people protecting each other while the police is not there for them. I pray you, God, to keep Egypt this way forever, and that is the real change! Long live Egypt. Long Live the Egyptian People! I saw freedom, dignity, justice, persistence, longing for victory, progress, and LOVE in those people.